I’m pretty proud of my son, who’s 13 years old and in 8th grade. 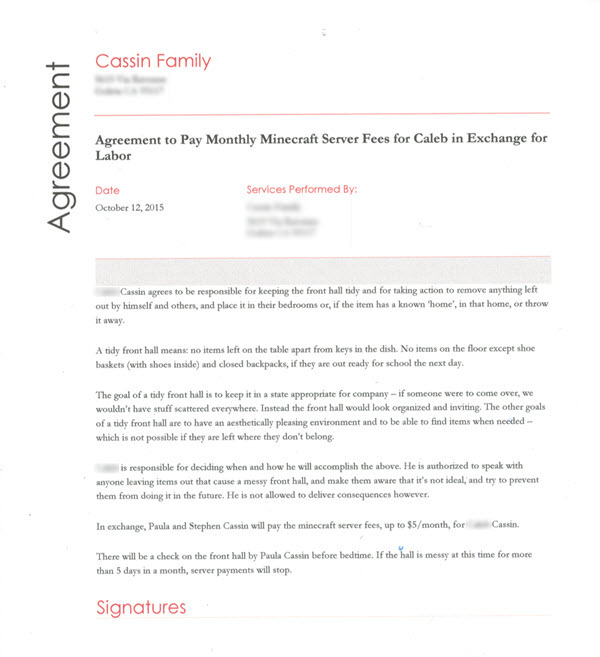 He came to me a few weeks ago and said, “Mom, I want to start a Minecraft server again.” He gave me a bit of background, and said he’d do work in exchange for me and his dad paying the server fees – just under $5.00 per month. We talked about it, and I asked why would this time be different to last time he had a server, which he abandoned in the end, etc.). 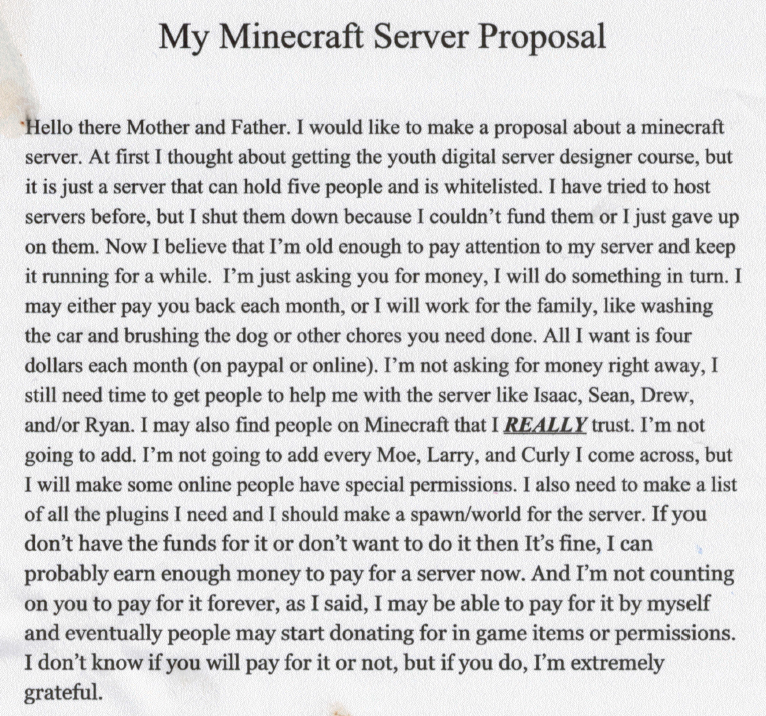 My son had some decent answers, so I asked him to write it up into a proposal for me. I was pretty happy with his proposal. He even got a Three Stooges reference in there (what in the world? where’d he hear about them? Google search). I decided I wanted to find a chore that a) no one was doing already as part of their weekly family responsibilities, b) was something beneficial to the family and not make-work, and c) was appropriate for $4-5 per month. I decided on: Keep the front hall tidy! My husband, bless him, doesn’t notice messiness, and he’s the one home during the day. The front hallway and table ends up covered with junk mail, school papers, small toys, key chains, Beanie Boos, dog leash, water bottles from volleyball, and on and on. It bugs my mother (with whom we are living right now). It bugs me as well, both for the mess and for the eventual grump my mom will have to let out, complete with ‘you’re slobs, how can you live this way, etc.’ (Yes, I know; well, we just do). So I proposed my son be responsible for keeping the front hall clear, which sounded do-able and more importantly, something he WOULD do (unlike washing the car for money, for example, which seems to be too much like hard work for 2 of my three kids) . I showed him physically what ‘tidy’ means to me (went with him to the front hall, commented on what should/shouldn’t be there). And I guess I’m happy with myself, too. My job as parent is to help my kids gain the skills they need to a) solve problems they face in life and b) take action to accomplish whatever they set out to do in life. I’m thinking my son is starting to learn how to put down in words what he wants, see it from another’s point of view and then persuade others to take action he would like them to take. This entry was posted in Future Skills, Parenting, Uncategorized. Bookmark the permalink.